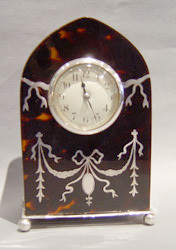 Fine Tortoiseshell mantel clock lancet topped with silver stringing and enamel dial. 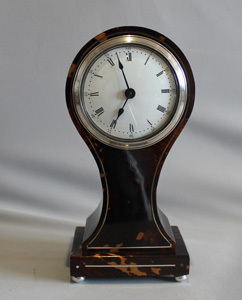 Antique English tortoiseshell and silver strung balloon shaped mantel clock. 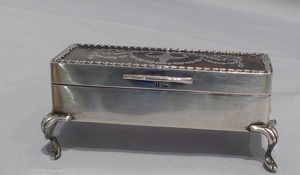 Crocodile cased dressing set in silver, crystal and tortoiseshell hallmarked for 1920. 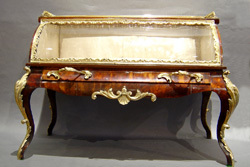 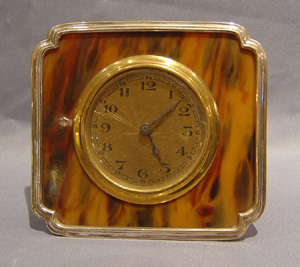 Antique Blond tortoiseshell and gilt bronze bracket or mantel clock in Queen Anne style. 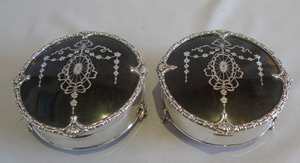 Pair tortoiseshell, silver and silver pique boxes by Mappin and Webb. 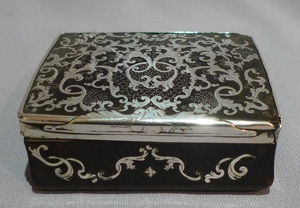 Antique silver, tortoiseshell and silver pique 18th century English snuffbox with piecrust hinge. 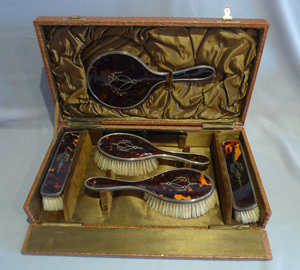 Silver and silver pique tortoiseshell hairbrushes and hand mirror in original case. 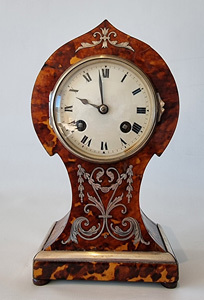 Antique tortoiseshell mantel clock with silver inlay and stringing and ivory feet. 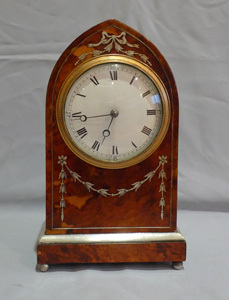 Fine antique tortoiseshell and silver inlaid lancet shaped mantel clock. 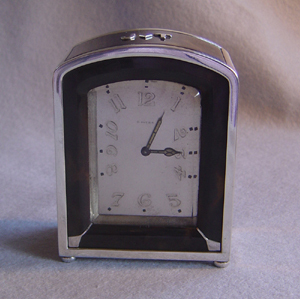 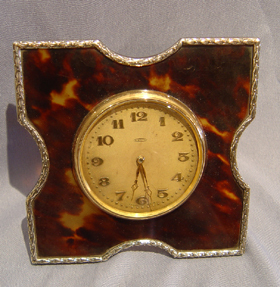 Silver and tortoiseshell pique mantel clock. 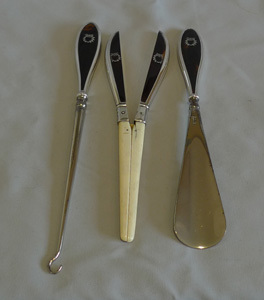 English ivory and silver and tortoiseshell silver pique glove stretcher, button hook & shoe horn. 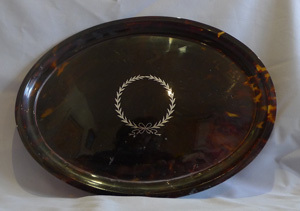 English tortoiseshell and silver pique tray. 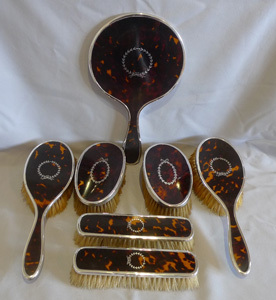 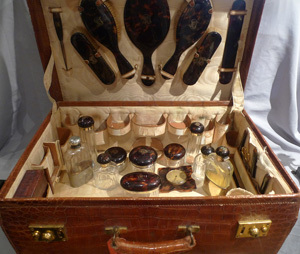 Harlequin set of tortoiseshell, silver piquer and silver brushes and mirror. 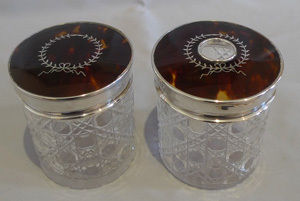 Pair tortoiseshell pique, silver and cut glass tall dressing table jars. 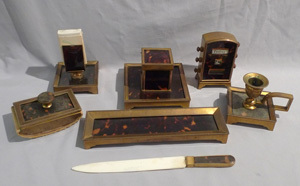 Antique tortoiseshell and gilt bronze desk set. 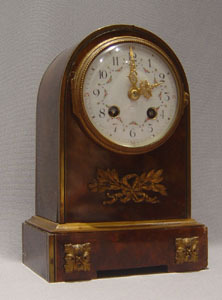 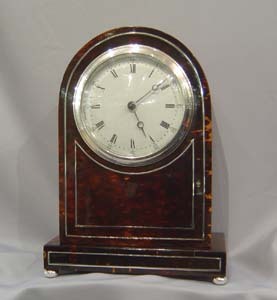 English ivory strung blond tortoiseshell mantel clock. 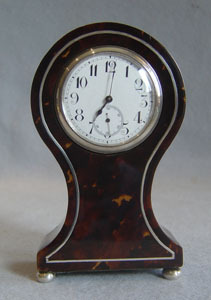 Antique English dome topped tortoiseshell mantel clock. 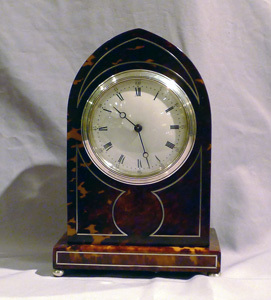 Antique English Edwardian tortoiseshell and silver mounted carriage clock. 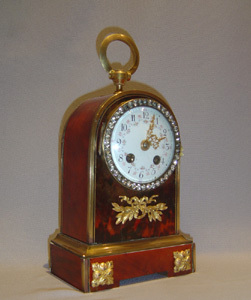 Antique English jewelled scarlet tortoiseshell and gilt bronze clockclock. 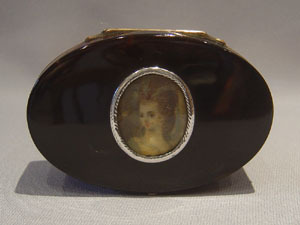 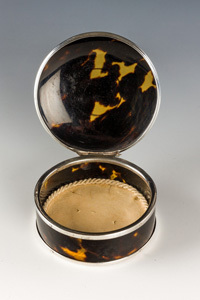 French antique tortoiseshell and gold box with watercolour on ivory to lid. 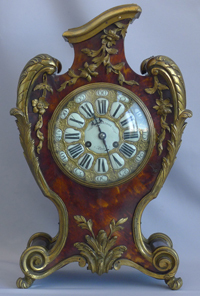 French antique dome topped tortoiseshell and bronze mounted mantel clock. 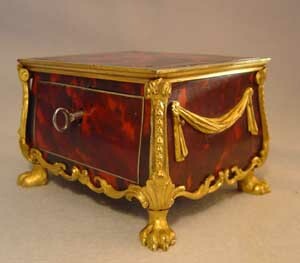 An antique French Louis XV ormolu mounted tortoiseshell patch or rouge box. 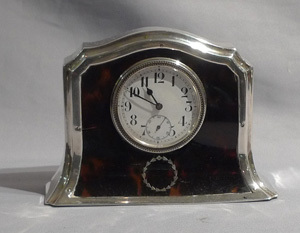 Antique Art Deco French silver and tortoiseshell 8 day carriage clock. 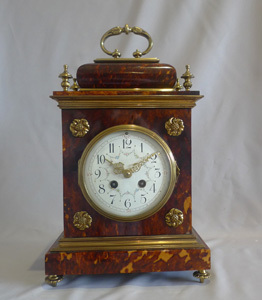 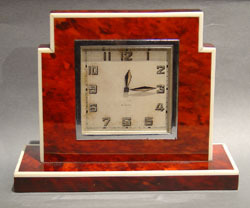 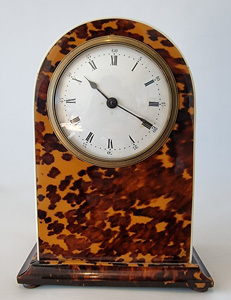 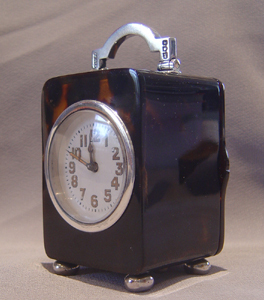 English scarlet tortoiseshell & ivory strung Art Deco clock. 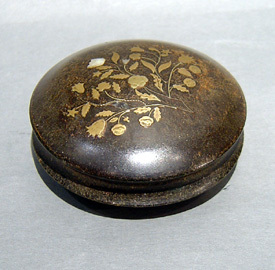 antique English tortoiseshell box inlaid with gold and abalone. 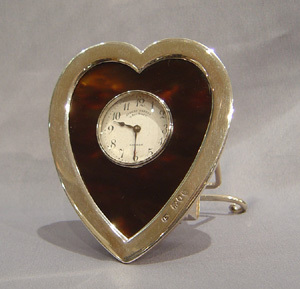 English silver and tortoiseshell heart shaped clock. 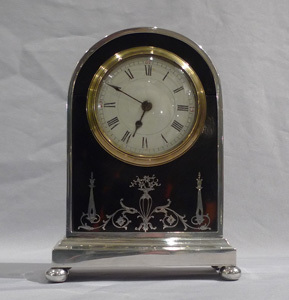 Antique English silver & tortoiseshell strut clock.